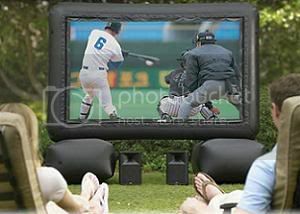 Just so you don’t have to miss a minute of television while you are spending time in the great outdoors, comes the inflatable outdoor theater. Find out what I am doing right now by following me on Twitter! This entry was posted on Thursday, June 8th, 2006 at 2:32 pm	and is filed under Uncategorized. You can follow any responses to this entry through the RSS 2.0 feed. Both comments and pings are currently closed.